Looking for some fun ten frames for your students? Well, give these Farm Day Ten Frames a try! Included in this packet are: two ten frames worksheets with numbers from 1-10 and one tracing and writing numbers 1-10 worksheet. 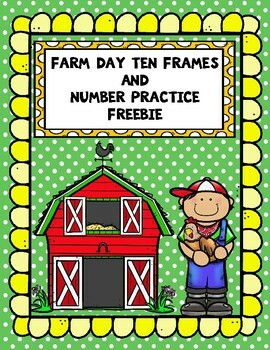 Students will enjoy filling in the ten frames and tracing their numbers on these cute farm worksheets! These worksheets are great for center activities, morning work, homework, or for your emergency sub tub! After downloading this product please click the back arrow and leave feedback if you found this product useful! Also, please consider following my store for more great freebies and products in the future! Thank you so much!! Also, find me on Pinterest and Facebook! !